Directs concussion downrange away from operator and peripheral shooters! Looks great tucked up under rails etc. Choose your Color, Standard Options ... These are it! Can be Soldered, or pinned onto a threaded barrel for a permanent installation if needed. 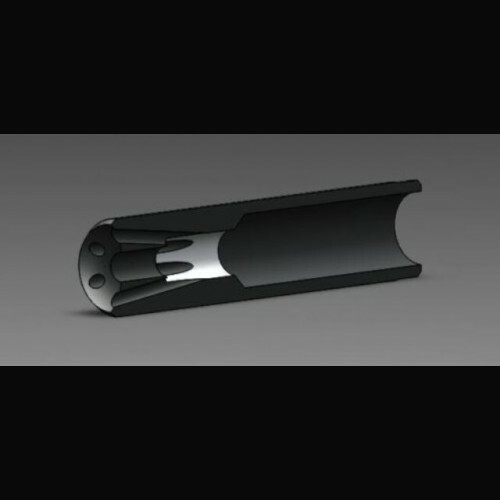 Tested and designed to increase stabilization and accuracy virtually eliminating muzzle rise to allow faster follow-up shots on targets! Buy with complete confidence!, Our reputation for quality, customer service, and warranty are second to NONE! Not Quite what you're looking for i.e. 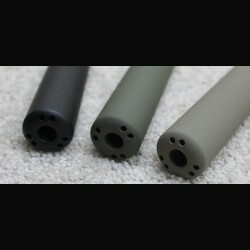 length, diameter, shroud depth, even listed thread pitch and caliber are likely available to be modded to your needs?... Please use the contact page to see what I can do for you! As Always, Thank you for your patronage and supporting American Business! Large Tribal Super 8 HALO ( LCTS8..
Standard FP Muzzle Btake ( SFP4.5..
Standard Concave Super 8 HALO Muzz..
Large " REAPER " Extreme Muzzle Br..
Standard Convex HALO Shrouded Muzz..
Large Convex HALO Muzzle Brake ( L..
Large " Gill " Extreme Muzzle Brak..
Standard Concave HALO Muzzle Brake..
Large Concave HALO Shrouded Muzzle..